Drywall comes in a variety of thicknesses, lengths and widths. Most types are available at retail hardware stores, but you may have to order some sizes through a lumberyard or building supply store, depending on regional buying habits. Whatever type you use, follow the manufacturer's specifications for installation, which vary among the different types. Drywall comes in many sizes. 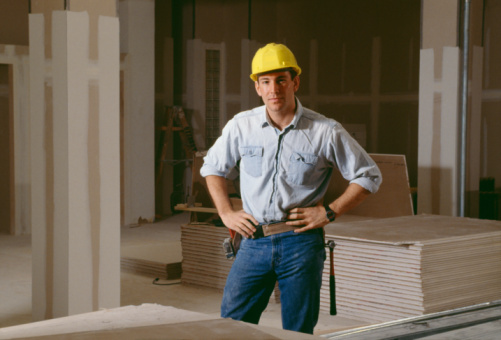 The standard horizontal lengths of drywall are 8, 9, 10, 12, 14 and 16 feet. The 8-, 12- and 16-foot lengths work well for residential construction, so most retail hardware stores carry them. Buy the longest boards feasible for your project. Longer boards mean fewer seams, which decreases the amount of finishing work later. The standard width of drywall is 48 inches. Most ceilings in new construction are 8 feet high, so installers mount boards lengthwise, one above the other. This forms a single long seam down the center of a wall, which makes the finishing job easy. For 9-foot walls, you can buy 54-inch-wide drywall, though chances are it will not be in stock in smaller hardware stores. Thinner drywall is more flexible, while thicker drywall provides increased soundproofing and fire resistance. The most common thickness is 1/2 inch, which works well for most projects. The thickest drywall measures 5/8 inch, so it is suitable for garages and building areas that have special fire code requirements. Quarter-inch drywall is thin and flexible, so installers use it over curved areas of framing, such as wide pillars or dish-shaped ceilings. Drywall that's 3/8-inch thick works well for patches in plastered areas because it won't jut out the way 1/2-inch drywall will. Thin drywall bows easily due to its flexibility, especially if the wood stud spacing is too large. Regional building codes often have specific requirements for stud spacing, so contact your local building department to determine which restrictions govern the types of framing your project must have. Typically, 16-inch on-center stud spacing is sufficient to prevent sagging and bowing, but consult the drywall manufacturer for specific recommendations for the drywall size you've chosen. How Hard Is it to Punch a Hole in a Sheetrock Wall?